John MacDougall is cruising aboard Annie Laurie his Catalina 470, a 47' sloop with a wing/fin keel and spade rudder. He began cruising as a kid in 1966 and has been cruising on and off since then. Over the last 10-15 years he has been doing more long-range and offshore cruising. His travels have included the Bahamas, Caribbean, North Atlantic and Mediterranean. More details about his various refit projects can be found on his friend's website. He can be contacted via ka4wja@mfi.net or via PM at SSCA's forum. When asked "Is there anything else readers should know?" 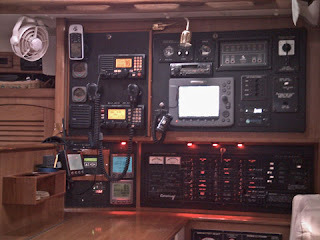 he replied: "Although, I've made my living in electronics and communications for 25+ years, and have an above average compliment of modern / advanced electronics on-board, I do NOT believe they are "necessary" and I do NOT rely on them, rather just use them as added-information devices...."
Regarding how bad - I've sailed thru many Full Gales in the North Atlantic, usually lasting 1 - 3 days (with winds 35 - 45kts, and seas of 20' +), and even sailed for 3 days, thru a named Tropical Storm in the southern North Atlantic (with winds 40 - 50kts). And while at anchor I've survived 3 direct hits (including all 3 eyes passing over) of Cat 3 Hurricanes (110 - 120 kts). As well as many instances of generic "rough weather", with 20 - 30 kts winds and 12'+ seas, whether in the Med, the N. Atl. or the Caribbean, you can get bad weather anywhere. Gosh, what a loaded, soft-ball, question since I like everything :) Like how she sails, how she steers, how well she handles heavy weather but can still perform like lightweight cruiser-racer, etc. etc. But, if I had to pick my favorite things (which aren't on the proverbial list of "must haves" you see written about everywhere these days) it's a 2-way tie. a) My cockpit.....I love it!! It's specifically and strategically designed / constructed with two competing goals in mind....having plenty of room for relaxing/lounging/etc. and being a safe / secure place to sit, lay, steer, navigate, trim, adjust, etc. especially when in heavy weather!!!! It's a marvelous design, which I found only after actually seeing (and using) it. Photos and brochure descriptions didn't do it justice. b) My Nav Station / Chart Table......mostly (> 95%) designed, laid-out, wired, and installed by me (with some constraints from some things). It allows for use of the entire chart table for charts!!! and allows all systems and electronics to be easily and conveniently used (and serviced) whether in heavy weather or sitting in a calm anchorage. These two things make my boat a dream to cruise / voyage on, or even just to lounge about and have cold beverage! And, that has not changed!!! a) Although they themselves may not realize that they're doing it, I find less and less cruisers are striving for independence and actually many cruisers who are relying on technology, as well as bringing on-board with them, much of the complexities of life "back-at-home" and "on-land". b) A growing emphasis (especially in those long-term cruiser-saturated locales) on the "party-lifestyle", with cruisers seeming to bring the alcohol-laden materialistic attitudes with them to "paradise", and usually unintentionally suppressing, rather than embracing, the local culture in the process. Please don't interpret the above as me ranting about the present, nor raving about the good 'ole days. It's just my description of the changes that I see. a) GPS. Plain and simple, GPS in my opinion has had the single biggest positive impact on boating, sailing, cruising, and voyaging. Understand that this coming from a guy who learned celestial nav as a teenager, and continues to play with my sextant and tables, when on a long passage, etc. But, having a GPS fix 24/7, rain or shine, that you can plot every hour or so, has revolutionized life on board. b) Although it isn't new technology, the improved cost effectiveness of solar energy, over the past 5 - 10 years, has also made a significant positive effect on cruising / voyaging. Part time cruising was just what we did when I was a young kid, and then more full-time later and even though I managed only part-time cruising for many years, that lust for adventure never goes away. The need to voyage to far off places, explore different cultures and share mine with them, and attempt to use mother nature as best as I can along the way, pretty much sums it up. b) Ventilation - especially if looking to voyage / cruise in the tropics, lots of strong, offshore designed and built, opening ports and hatches (and add lots of 12vdc fans as well). Yes, both the Azores and Canary Islands. The people were happy and friendly, their cultures were interesting, and the scenery was fantastic. I'm looking forward to spending more time cruising around both, the next chance I get. Well, I never bought into the consumer-driven lifestyle, even when working full-time in my own business, I knew I had a reason for working and it wasn't to buy a fancy new car, but rather to enjoy my family, my friends, and my life voyaging and cruising. So, some landlubber, high-living, baby-boomers may think I sacrificed some things, but I don't think so at all. I simply "kept my eyes-on-the-prize" and since I'm now only in my late 40's, I've still got places to go (and some to go to again) and people / cultures to enjoy!!! My advice: Don't buy that new car, or that new Plasma screen TV, etc. Enjoy what you have, especially your friends and family, and don't spend every $ on useless crap that you don't "need", and you'll find your dream within reach in no time at all. I have two that come to mind immediately, one serious and heart-warming, and one funny. a) Hanging onto the wheel with both hands, as the Lavante wind driven spray drenches my glasses, I'm smiling ear to ear. Yes, I'm tired, and we're close hauled, beating hard into steep 6' - 8' seas, with 20 - 25 knots of wind across the deck, but I'm smiling. I haven't slept more than 4 to 6 hours out of every 24 in weeks, and we've been hand steering for the final 300 miles, and I'm still smiling. There are more than a dozen freighters, container ships, and tankers, whizzing by at full cruising speed, in both directions, just a few hundred yards off my starboard side, but this doesn't phase me at all. After more than 4000 miles of sailing, the Rock of Gibraltar is just a few miles ahead and Jebel Meza, the pillar marking the entrance to the continent of Africa, is visible thru my salt stained lenses. And while I excuse most, including my crew of 2 (my sister Laurie and our friend Jordan, who are busy staring in awe through their camera lenses), from misunderstanding my smile, there are 2 people on the planet that do understand my smile, even though they are 4000 miles away, and won't see me for some time, those 2 understanding souls are my Mom and Dad. b) Freaking out dozens of Europeans, when grilling some "Bubba Burgers" on my gas grill off the stern in Marina Horta (Faial, Azores), in celebration of a 3000+ passage from Florida. Some onlookers were certain we were on fire, and a few even ran down the quay shouting in multiple foreign tongues...but, alas we were just friendly outgoing Americans, "sharing some of our culture"!!! This one here from the question bank: Can you think of a sailing tip specific to offshore passages? 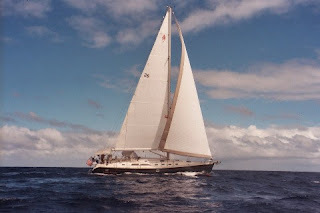 b) I'm of the opinion that chartplotters have their usefulness (I have 2 on-board), but when sailing offshore, and/or on passages, it's a waste of energy, space, and $$$. Plot your course on paper charts and fix/plot your position on them (GPS and celestial / DR) regularly.